Charlie Moore, staff writer for the Mail Online, the digital segment of the Daily Mail, published his article ‘Revolution is Coming’ on August 8th, 2018. His article focused on the delicate position the mullah’s find themselves in following last weeks protests. He wrote, “Iran is on the brink of revolution”, describing, “thousands flooding city streets”. Moore describes the Iranian discontent as stemming from the reintroduction of US sanctions, which is limiting Iranians access to US banknotes and key imports. He also alluded to the economic crisis ravaging Iranian cities, causing spiraling inflation. The Iranian rial has lost 99% of its value. With the reintroduction of US sanctions on the horizon, the situation is unlikely to improve and could become markedly worse. Many Iranians are stocking up on foreign currency to get themselves through the crisis. Ali, the owner of a kitchen store in Tehran’s bazaar, described a scene of consumers panic-buying essentials before the sanctions hit. “People are worried that if they don’t buy things today, they won’t be available tomorrow,” he said. Foreign companies that arrived following the Iran deal are leaving. Total, Peugeot, and Renault are among the companies making the exodus from Iran. Hanif Jazayeri of the Iranian opposition organization, the National Council of Resistance of Iran (NCRI) was interviewed for Moore’s article. He outlined crucial differences between the current wave of protests and those that gripped the country in 2009. In 2009, a spate of protests spread rapidly across Iran. They featured a majority middle-class demographic and were a public backlash towards President Mahmoud’s re-election. Unlike the 2009 protests, the most recent round of protests has attracted Iranians across the social and economic spectrum. Demonstrators not been limited to the middle classes, but included women, the rural poor, the middling urban classes, students, factory workers, truck drivers, investors, and many more worker demographics from Iran’s rich social landscape. Jazayeri also points out that the slogans adopted in the recent demonstrations indicate an underlying frustration which could boil over into revolution. Instead of protesting individual incidents, protestors are directing their anger at the regime itself. Slogans such as “death to the dictator”, and, “the nation is forced to beg while the leader lives like a God”, have become commonplace. Jazayeri said, “these are different because people are calling for the death of the President and Supreme Leader”. He added, “people are starting to wake up and see that revolution is a real possibility. I think there will be one”. The scale of the protests has also been overwhelming. 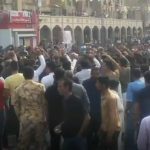 In the January protests, 142 of Iran’s cities and towns were affected by protests. More recently, a video depicting more than 100,000 football fans protesting in the street following a football match recently circulated on social media. The other factor that will have the mullahs concerned over their future in power has been the sheer will and determination among the demonstrators. The very act of protesting in the street in Iran comes with enormous risk. Protestors are often arrested and even killed as the regime tries to silence demonstrators through violent and repressive means. Despite the risk involved, protestors have shown their bravery and determination and taken to the streets in the thousands. 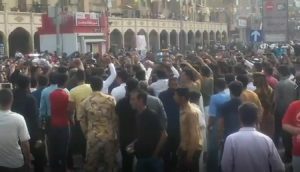 Footage from Gohardasht shows protestors scrambling to escape the regime’s tear gas. In another video, filmed in Isfahan, demonstrators set fire to tires in an attempt to mask the irritant gas. For Iranians, the only way out of this economic freefall is through regime change. President-elect of the NCRI, Maryam Rajavi, has echoed this sentiment. She issued a statement of support in early August hailing the demonstrators and applauding their determination. The regime is committed to spending billions of dollars in funding conflicts in Syria, Yemen, and other local conflicts around the Middle East. Rouhani has also plowed Iranian funding into creating an elaborate network of espionage and terror in Europe and beyond. Given the country’s economic turmoil, the reintroduction of sanctions, and the determination of the local population, it is difficult to see a resolution where the existing regime maintains its grip on power. The status quo is simply unmanageable. As the economic situation worsens once the US sanctions come into full effect in November, and the population further suffers the effects of the regime’s economic mismanagement, a united, determined population will rise up, hungry for change.